My eldest grandson, Nikitas, is ten. When his name was chosen I was haunted by memories of Russian leader Khruschev and his long-ago shoe-banging performance at the United Nations. But of course those recollections meant nothing to my son and daughter-in-law, who patiently explained that their son was to be called after Nikitaras, great Nikitas, a hero of the Greek War of Independence (1821–1828). Nikitaras, whose real name was Nikitas Stamatelopoulos, reportedly had many virtues, was sea-green incorruptible, and as a consequence died in poverty. In the prime of his life, though, he was a mighty warrior before the Lord. Alas for modern sensibilities, however, he was nicknamed Ο Τουρκοφαγος, the eater of Turks. One example of his prowess came at the Battle of Dervenaki in July 1822, in which the Greeks were victorious; Nikitaras is supposed to have used five swords: he broke four during the savage conflict. Thankfully, young Nikitas does not divide the world into friends and enemies, at least not so far. But he is very competitive; perhaps his name, which means invincible, influences his outlook. Athletics is his thing, particularly the long jump, but he loves all sport, and also loves to win. Like a great many of us. So far, so satisfactory: he and his brother, who has a more relaxed attitude to the whole business of competition, have a bedroom wall liberally sprinkled with medals. But the times they are a-changing. And he's finding the process difficult. Picture the scene. 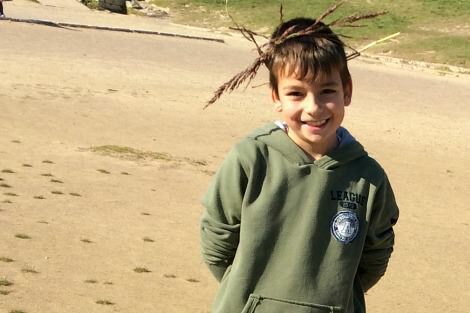 His aunt Nina recently asked Nikitas how he'd performed at the latest athletic competition. His answer to the question was a heavy sigh: Greek drama is never far away. 'Mavri imera.' A black day. "It seems to me the child, who is all too rapidly turning into a man, is learning one of life's important lessons, perhaps not a minute too soon: renunciation comes to us all." Nina said she was sorry to hear this, and asked the reason. Not excellent enough in Nikitas' view, as another heavy sigh was his reaction to Nina's praise. So she was moved to give him a burst about the Olympic spirit, the importance of simply taking part, and so on, but he was apparently not to be persuaded. My son, in the meantime, informed me that he had been telling Nikitas regularly that he cannot expect to win all the time, that he cannot always have what he wants. It seems to me that the child, who is all too rapidly turning into a man, is learning one of life's most important lessons, perhaps not a minute too soon: renunciation comes to us all. A Catholic friend sums the matter up by saying simply: 'God reserves the right to say NO.' And I think God usually means it. Bertrand Russell, agnostic mathematician and philosopher, went into rather more detail in his book A Free Man's Worship. Despite his doubts, Russell considered the acceptance of submission to power to be just, right, and 'the very gate of wisdom'. Although to the young all things desired and passionately sought are attainable, we all must learn through death, illness, poverty or the voice of duty, 'that the world was not made for us, and that, however beautiful the things we crave, Fate may nevertheless forbid them'. We must learn to find the courage then to 'bear without repining the ruin of our hopes, to turn away our thoughts from vain regrets'. I rather wonder what Russell would have had to say to Donald Drumpf and Hillary Clinton in their battle of wills and their passionate desire to get what they want in the shape of the US presidency. I imagine there is plenty of vain regret ahead for one of them, as he/she faces the ruin of many hopes. Bernie Sanders, who seems to have his ego under much more control, will cope far better, in the certain knowledge that he has fought a mighty battle for ordinary Americans. As for Nikitas, since the disappointment of coming second he has moved up into a higher age group, where naturally the competition against older children is much stiffer. He appears to be coping well, to collective relief. We are grateful there have been no more references to black days. Pictured: Nikitas on the track at Ancient Olympia, wearing the 'crown' his father made. Such a sweet face, a fortunate child with a loving, supportive family. God bless all children and families, help us all to be kind to each other. Thanks Gillian for such a heart warming story. It would be nice if we left young people like Nikitas to enjoy themselves at games, learn to lose and get on with life. Sadly, these days we attempt to turn everyone with talent into a professional sportsperson whether it suits them or not. Hopefully Nikitas and so many others will learn that life is bigger than sport. Thanks for your article Gillian... Yes renunciation comes to us all, and usually tempers us to greater maturity. These are hard lessons; when sport and life get tougher. “Ever Tried. Ever Failed. No matter. Try again. Fail again. Fail better.” -Samuel Beckett comes to mind as a good thing to remember. Nikitas has a few lessons to learn but he has good role models to follow. My own Alexander proudly announced at his first school sports that he had come third. my thoughts were that with a bit of effort he could have won. Moderation in all things but a bit of aspiration is no bad thing! When suicide bombers struck Brussels, I was travelling far from home, in southern Italy. The news evoked in me a sense of vulnerability, for within days I would board a series of flights from Reggio Calabria to Rome to Abu Dhabi and then Sydney. For a moment, it seemed the terrorists had achieved what they set out to do: spread fear and distrust far beyond the site of their attacks, across countries and continents and oceans so that eventually the whole world would be infected.